Be the first to share your favorite memory, photo or story of Mrs. Inez Williams. This memorial page is dedicated for family, friends and future generations to celebrate the life of their loved one. 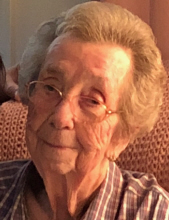 Mrs. Inez Williams Meadows, age 95, of Jackson, Georgia, passed away on Saturday, January 19, 2019 at Eternal Hope Hospice (Griffin, Georgia). Mrs. Meadows was born June 7, 1923 to Mr. James Lee Williams and Mrs. Nettie Josephine (Holland)Williams. Mrs. Meadows was married to Mr. Benjamin Harris Meadows for 58 years prior to his passing. She worked as a seamstress at Floyd Toggs and also as a homemaker. Mrs. Meadows was preceded in death by: her husband, Mr. Benjamin Harris "Ben" Meadows; her parents, Mr. and Mrs. James Lee (Nettie Josephine Holland) Williams; her daughter and son in law, Faye and Leonard Dollar; her daughters, Janice Nadine Meadows and Cheryl Ann Meadows; Son in Law, Mr. Harold Crider; Brother and Sister in Law, Chesley and Wynell Williams; Brother in Law, John Henson. Mrs. Meadows is survived by: Daughter, Mr. and Mrs. Walt (Betty) Chadwick; Daughter, Mrs. Bobbie Crider; Grandchildren, Stephanie Bazzell (Ric) and Jennifer Smith; Great Grandchildren, Sarah Reagin, Joshua Bazzell, Benjamin Cowart, Hannah Cowart and Madisyn Jones; Sister, Mr. and Mrs. Hugh (Faustine) Wilson; Sister, Mrs. Joetta Henson. Funeral Services for Mrs. Inez Meadows will be conducted Tuesday, January 22, 2019, 2:00 P.M. at High Shoals Baptist Church. She will lie in state at High Shoals from 1:30 - 2:00 P.M. Rev. Jimmy Tibbitts will officiate. Interment will follow at High Shoals Baptist Church Cemetery. Visitation for Mrs. Meadows will be Monday, January 21, 2019, 5:00 - 8:00 P.M. and Tuesday, January 22, 2019, 12:00 - 1:00 P.M. All visitation will be held at Benson Funeral Home. To send flowers or a remembrance gift to the family of Mrs. Inez Williams Meadows, please visit our Tribute Store. "Email Address" would like to share the life celebration of Mrs. Inez Williams Meadows. Click on the "link" to go to share a favorite memory or leave a condolence message for the family.